You are at:Home»News»Cruise and Stay Leads the Way! But Why? Cruise and Stay Leads the Way! But Why? Cruise and Stay holidays are going to be The Next Big Thing in vacationing. But what exactly are they, and what makes them so popular? What is a Cruise & Stay Holiday? A Cruise and Stay holiday combines the best of both worlds – cruising on the seven seas and overnight stays in exotic locations. With standard cruises you are often limited to just 8 hours in any destination. You arrive just after breakfast and leave at sunset, so there’s not much time to explore and immerse yourself in the culture. This is fantastic if you want to see lots of places in one short trip, but if you prefer a slower pace, Cruise and Stay is a great alternative. Cruise and Stay holidays often include a week at sea followed by a week at a hotel (or vice versa). These timings are of course variable, and you can tailor the package to suit you. You get two holidays in one – as previously mentioned, Cruise and Stay holidays combine the very best of both cruising and static holidays. And more time to explore your must-visit destinations. Spend a week (or longer) taking in the sights of the world’s most incredible locations. Bespoke packages just for you – you choose when you cruise and when you stay. The majority of trips include escorted tours and free excursions. Let the travel experts plan tours and trips for you so you can make the most of your holiday. Flights are included, as is all accommodation, meals and in some cases even your drinks. Do Cruise and Stay Holidays Float Your Boat? If you’re interested in trying your first ever cruise and stay holiday or even if you’re a seasoned pro, Cruise 1st’s section of cruise and stay packages offer fantastic value. Take a look or chat to us on 0808 274 6777. 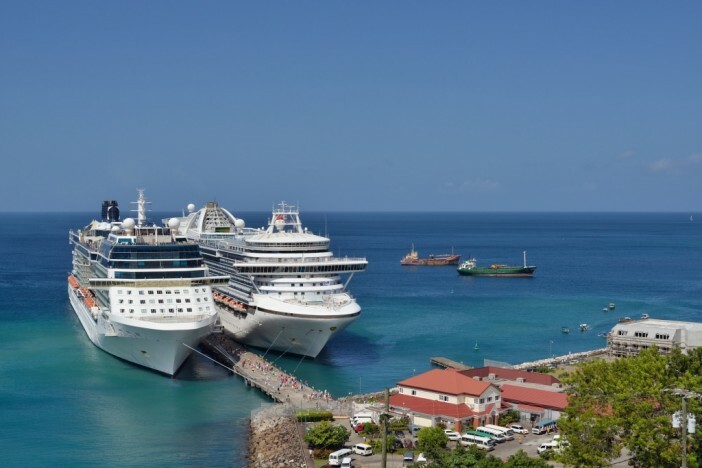 The Emerald Princess and the Celebrity Eclipse docked at St Georges, Grenada.